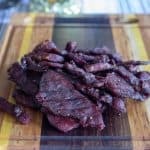 Are you looking for a simple smoked jerky recipe? Look no further! 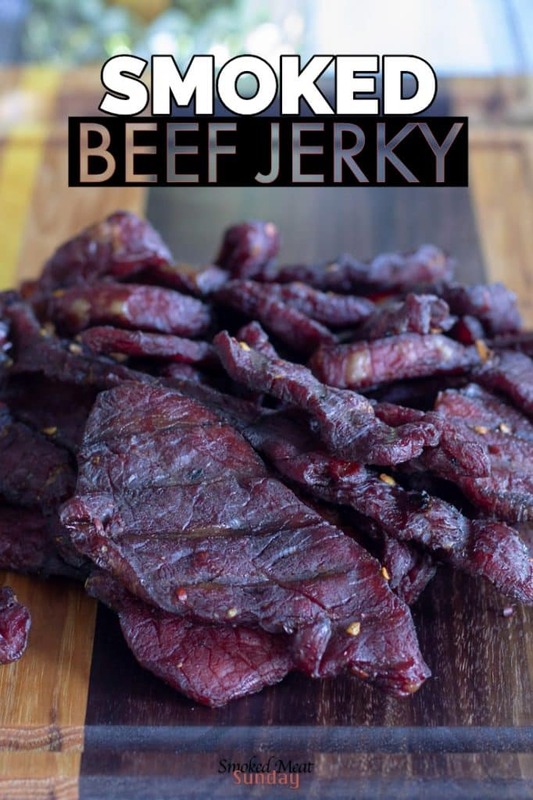 In this post, I’m going to teach you how to make perfect smoked jerky using a pellet smoker. I used elk round for this recipe, but it’s great with beef, or venison too. The first thing you need to do is slice your meat into 1/4 or 1/8 inch slices against the grain. The easiest way to do this is to partially thaw your round steaks, and then slice against the grain. If you wait until the meat has completely thawed it will be hard to get consistent thickness. While you’re slicing, be sure to trim away any pieces of silverskin or fat on the meat. The silverskin is not great after it’s been smoked. Put all of your slices of meat in a gallon zip lock and set off to the side. In a medium sized bowl combine soy sauce, beer, honey, Worcestershire, garlic salt, onion powder, red pepper flakes, and brown sugar. Whisk the ingredients together, and then pour them into the zip lock with the sliced meat. Squeeze as much air out of the zip lock as you can, and then seal it and place in the fridge. I like to let the meat marinate for at least 12 hours, but I’ve found it’s best if you can wait a full 24 hours. That’s enough time for the flavors to really get absorbed into the meat. This jerky was really tasty… Also, check out that cutting board! After the meat has marinated for at least 12 hours remove the bag from the fridge, and place your slices of meat on a cookie sheet lined with foil paper towels. Place one layer of meat, and then add paper towel, and add another layer of meat. Continue this process until you’ve placed all of the meat on the cookie sheet. Mopping up the extra moisture helps the meat cook more consistently. Our end goal is to use the smoker to dry out the meat, you can skip this step, but you’ll add time to your total cook. 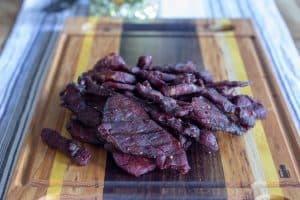 I’m in love with this smoked beef jerky recipe. Once you’ve soaked up the extra moisture, it’s time to add the slices to your smoker. Set the smoker to smoke at 180 degrees, and place each slice of meat directly on the grill grates. A jerky rack is helpful if you are running low on space inside your smoker. After two hours of taking on smoke, check on your meat. You want to let the jerky continue to smoke until the meat just barely bends when you shake it. It usually only takes about 2 to 2 and a half hours until jerky is done on my smoker, but it can vary. Keep an eye on it after the two hour mark, and pull off any pieces that finish before the rest of the batch. When the jerky is done smoking place it on a rack to cool. Once the meat has come down to room temp place it in a zip lock bag or sealable container, and place in the refrigerator. The jerky will keep for a few weeks in the fridge, or for months in the freezer. Remove the meat from the marinade and blot dry with a paper towel. Place the meat on your smoker and let it smoke at 150 to 180 degrees for 2 hours. Check on the meat at 2 hours. Some of the pieces may be done; you can tell if you pick up a piece and when you shake it, it doesn’t bend. Place the jerky on a cooling rack until it’s come down to room temp, and then store in an airtight container in your fridge.